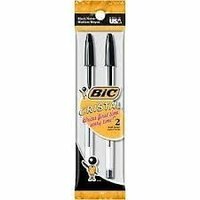 The iconic BIC Cristal Xtra Smooth Ball Pen is "The Pen America Grew Up With". It has proven reliability, long-lasting dependability, and features the BIC Easy Glide System: a propriertary ink technology that delivers ultra smooth writing. All BIC Cristal ball pens feature a hexagon-shaped barrel to prevent rolling off surfaces.